Breckenridge Brewery has a pretty awesome looking beer dinner coming up this weekend in Colorado Springs, the menu was just released and it looks great. 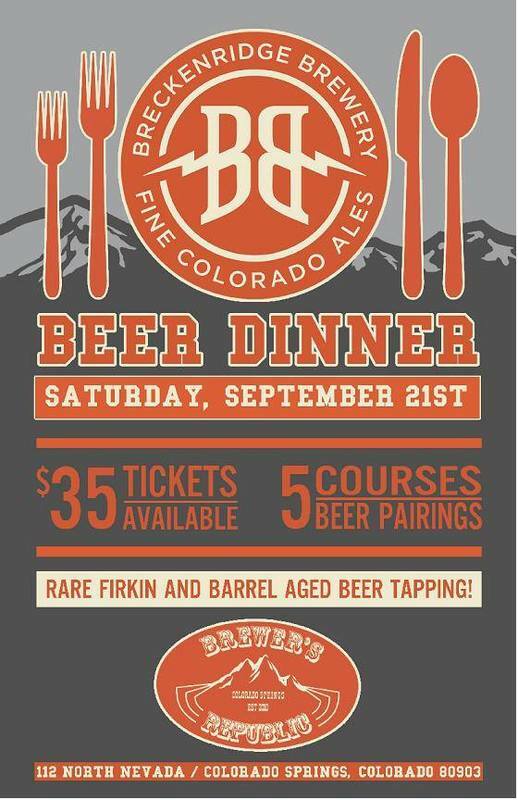 This whole week is jam-packed with all sorts of beer events across the Pikes Peak Region, so if you find yourself wanting to hang out in the downtown area, I’d give this dinner a big recommendation. Breck will have two really special beers available including a Barrel Aged Summerbright, which is usually a pretty easy drinking wheat beer, and they’ll have a firkin of their Oatmeal Stout with the added goodness of chocolate and coffee. They’ll also have seasonals and other great favorites. Caesar salad with chevre, served in a parmesan basket. Brewer’s Republic is located at 112 N. Nevada, Colorado Springs, CO. Beers Made By Walking – Sneak Peek #01 with Boulder Beer Co.